The Toronto Blue Jays today announced the Buffalo Bisons coaching staff that will serve under new manager Bobby Meacham. Former three-time All-Star and seven-time Gold Glove winner DEVON WHITE has been named the new hitting coach for the Buffalo Bisons while two-time All-Star and Boston Red Sox Hall of Famer BOB STANLEY will return for his third season as Bisons pitching coach. Toronto also announced that AARON MATTHEWS has joined the Bisons staff as a position coach. VOON CHONG will return for his fifth consecutive season as Buffalo's athletic trainer and JASON DOWSE will return as the Herd's strength and conditioning coach for a second consecutive year. For White, this appointment marks his coaching debut in the Blue Jays system. In recent years, the three-time World Series Champion has been involved with the Jays Care Foundation, teaching the game to youngsters in the annual Blue Jays Baseball Academy, as well as his own Devon White Baseball Academy. White served as the outfielder and baserunning coordinator in the Washington Nationals farm system from 2008-2010 and as the minor league baserunning coordinator for the Chicago White Sox from 2011-2012. White spent five seasons of his 17-year Major League playing career with the Blue Jays, helping the club to their back-to-back titles in 1992 and 1993. He won a Gold Glove in each of his five years with Toronto and was an American League All-Star for the Blue Jays in 1993. Overall, 'Devo' averaged .263 with 1,934 hits, 208 home runs, 846 RBI and 346 stolen bases playing for six Major League teams from 1985-2001. He won his third World Series Championship with the Florida Marlins in 1997. Stanley served as the Bisons pitching coach in 2013 in their first year as Triple-A affiliate of the Blue Jays and returned to the post last season. The team's 3.74 ERA in 2016 was the ninth-best mark in the International League. The staff, highlighted by midseason All-Stars Drew Hutchison, Ben Rowen and Dustin Antolin, led the IL in saves (45) and issued the fifth fewest walks (392) in the circuit. Stanley has been a coach since 1997, working six years in the Mets (1997-2002) and Giants (2003-2008) minor league systems. He first joined the Blue Jays organization in 2012 as the pitching coach with the Triple-A Las Vegas 51s and was Toronto's Major League bullpen coach in 2014. He played 13 years in the Major Leagues, all of them with the Boston Red Sox. 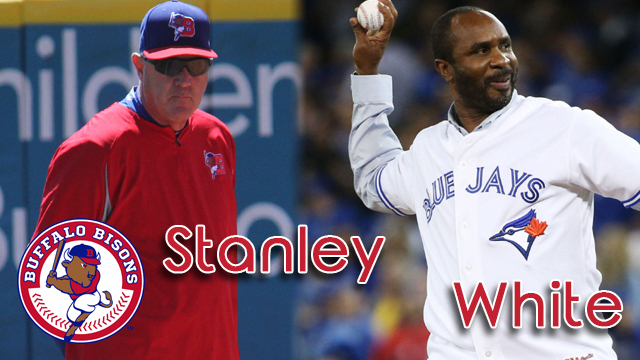 Stanley was Boston's all-time saves leader with 132 until Jonathan Papelbon passed him during the 2009 season. Overall, Stanley was 115-97 with a 3.64ERA and 693 strikeouts in 637 career games. He was inducted into the Red Sox Hall of Fame in 2000. Matthews is entering his third season as a coach in the Blue Jays system, having served as the hitting coach for the Bluefield Blue Jays of the rookie-level Appalachian League. Last season, Bluefield finished 1st in the Appalachian league in stolen bases (119) and walks (285), second in on-base percentage (.347) and third in home runs (57) in 68 games. Formally a 19th round draft pick of the Blue Jays in 2004, Matthews played seven years in the Blue Jays farm system and reached the Triple-A level in both 2009 and 2010 with Las Vegas. In his nine total professional seasons, the former outfielder hit .281 with 53 home runs and 365 RBI in 791 games. Chong enters his 16th season in the Toronto organization and his eighth as the athletic trainer for the Blue Jays' Triple-A affiliate. He was named the 2007 Eastern League Athletic Trainer of the Year while serving that role with New Hampshire. Dowse is entering his seventh season in the Blue Jays minor league system as a strength and conditioning coach.